Every region has its quirks, and Colorado has plenty. Some of them might land on your plate in the form of a menu item. If you’re looking for a new culinary adventure — or a dare — here are some of the strangest food that you can find in Colorado — and where to try it for yourself. If you are feeling adventurous. Coloradans know this one’s a given for the top of the list. If you don’t know what these are, er, they’re not from the sea. They're not a special breed of seafood raised in alpine lakes either. They are deep fried bull, pig or sheep testicles. We’ll pause so that can sink into your comprehension. Yeah. So. That's a thing. This supposed delicacy is traditionally dipped in cocktail sauce and served as an appetizer. You may also see them sliced up (this different shape helps the mental hurdle). Rumor is they taste kind of like calamari (maybe that's where the name came from? ), but we confess: We don't know firsthand. Although these are a Colorado staple, you won’t find them on many menus. (Go figure.) But you can find them served with a horseradish dipping sauce at The Buckhorn Exchange, “Denver’s oldest restaurant.” This was Denver’s original steakhouse and has been serving Old West food since 1893. Why not? Euclid Hall in Denver serves bruleed center cut beef marrow bones to gnaw on. Eat them with a house XO sauce, Thai herbs and grilled sourdough. Not feeling boney? Try the Pad Thai Pig Ears, served with a tamarind chili sauce, scallion, peanut, egg, sprouts, mint and cilantro. 3. Pizza crust with honey. Colorado natives will be shocked to learn this isn’t how everyone eats their pizza. Smother the crust remains in honey, and you have Colorado Mountain Style Pizza. Beau Jos Pizza is best known for this tradition. In fact, they even make pizza with honey-flavored crust, in white or whole wheat. You’ll find bottles of honey on every table, along with the parm and peppers. Beau Jos has locations throughout the state, but it’s a must-do to visit the original location in Idaho Springs. Many other Colorado pizza joints put honey on the condiment table, too, right next to the parm cheese and crushed red peppers. Rattlers are common on the Front Range and foothills, so it’s no surprise that some cowboy made a meal out of them. Find smoked rattlesnake served atop a chipotle cream cheese dip and chips at The Buckhorn Exchange in Denver. At the exchange, you can also find buffalo sausage and alligator tail (not that Colorado could claim that as a local staple, although there is an unexpected alligator farm in San Luis Valley in southern Colorado). The Waffle Lab in Fort Collins calls its waffles “highly evolved.” Alone, these are Belgian-style waffles (not Colorado style), even made with imported Belgian pearl sugar, which melts on the inside and caramelizes into a crunch on the outside, so you don’t need any syrup. But only in Colorado can you find these odd waffle combinations, such as a grilled cheese sandwich made between waffles, or a waffle smothered in Colorado-made Noosa honey yogurt, fruit, granola and maple syrup. Anything you can imagine on a waffle goes. 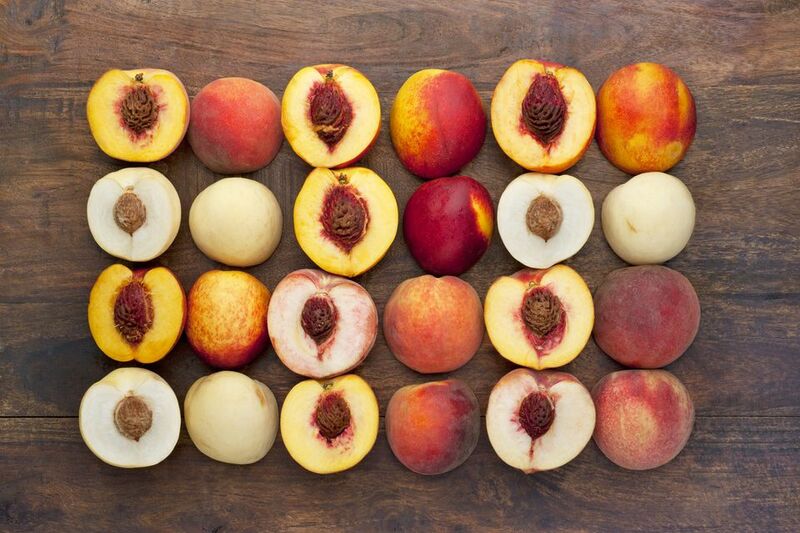 Palisade takes its peaches seriously, and when they’re in season, you won’t believe what creative chefs made with them. Peach jelly, jam, salsa, soap. The Peach Street Distillery even makes peach brandy, made with 26 pounds of local peaches in each bottle. Visit the distillery for a tour and sample of the peachy goodness. It’s the oldest locally owned distillery in the state and worth a visit for that reason alone. 6. Green chile on everything. Coloradans love our chile. We call green and red blended together “Christmas.” Slather it on your omelet, hamburger, chocolate cake (for reals) or even your pizza. It’s not unusual to order a side of green chile to just eat with a spoon like soup. Get green chile on your pizza at Dion’s Pizza in Colorado Springs. Order The Special: Italian sausage, mushrooms, black olives, red onions, smoked ham, pepperoni, ground beef and green chile. Who needs red sauce? Blank & Booth Distilling Co. in Denver makes a hatch green chile-flavored whiskey called Hot Mess. Drink it plain on the rocks or as a cocktail, like the Hot Mess Poison Ivy: the spicy whiskey mixed with Sauvignon Blanc, lemon juice and maraschino liqueur with an absinthe rinse and garnished with a lemon twist and parsley. Find the Poison Ivy at the Corner Office in Denver (that's a bar, not a workplace).